A few days ago I had my first stall at Hamilton Zinefest! It's not New Zealand's largest zinefest, which quite frankly is a good thing because Auckland Zinefest is so crowded that I was afraid of even entering the building last year. A zinefest is a place to sell and swap zines (self-published books/comics/diaries/art etc). 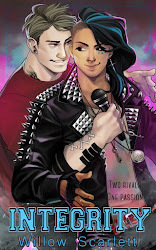 I have been attending zinefests every year for as long as New Zealand has had them, and I grew up reading library books about zines and dreaming of making my own. So it was greatly exciting to have my own stall! I displayed five novellas/short story collections under two pen names, as well as cloth patches. All my zines had handmade custom covers which was really fun, but omg printing is expensive. I was nowhere near covering printing costs, let alone the buses to and from the fest. 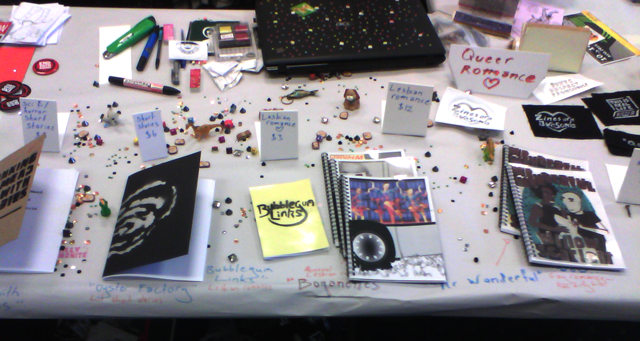 But no one is into zines for money, and I got to meet a lot of incredible people and have some great conversations. Plus I went home with about four billion new zines and posters. I count that as a successful day. 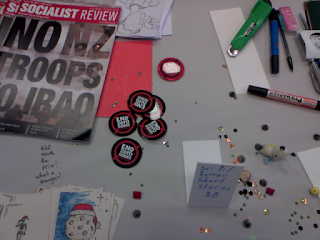 One of the highlights of the fest was bonding with my queer socialist punk stall neighbors. They had Socialist Review, I had a stack of End Zero Hours stickers and glitter. It was a match made in heaven. 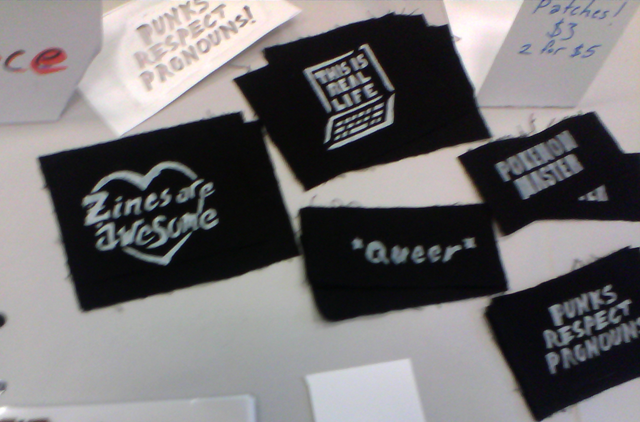 Excitingly, my most popular item was the patch that says 'punks respect pronouns' in my handwriting which looks deliciously like the One Direction font. I made a 'zines are awesome' patch specifically for the fest, but I guess the crowd know when they're being pandered to because no one even picked it up. I'm planning to attend at least one more zinefest this year - Auckland Zinefest, the terrifyingly popular one. The ideal zine would be priced under the cost of printing a novella, so I'll never have much commercial success. But I love getting to talk to zine folks. I especially enjoy talking about romance novels and their place in culture, and the detrimental effects of benevolent sexism. 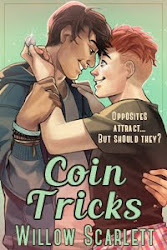 It's an important conversation and one that I think most people who don't read romance have never thought about. Plus, I love finding new zines!